A Dopp kit is a simple, usually single-zip, toiletry kit that was named for leather craftsman Charles Doppelt, who designed the case in 1926. 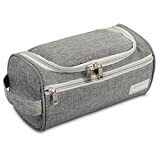 They are a fantastic option for anyone looking for a no-fuss way to transport their toiletries from point A to point B. Their overall shape makes them easy to pack and the simple design will surprise you in its spaciousness and versatility. If you want to stay groomed and tidy at the gym, on a trip, or on the trail, make sure you’ve got one of these with you. Don’t forget to fill it with travel-sized versions of your favorite products! This is a classic Dopp Kit if I’ve ever seen one. It is slim and rectangular in shape and has the classic side handle, which makes it easy to pick up and toss in your bag. The top has zippers on both sides, which allows the top of the case to peel all the way open like a can of tuna to reveal the contents inside. There is also a small side zipper pocket for smaller or more delicate items. This item is made out of fine leather, which makes for luxurious travel, and it is also a callback to the original Dopp Kit of 1926! The product is classic, yet unique. The manufacturer even says “KomalC is the inspiration born through our admiration for unique handmade accessories for men and women across the globe. Items that have their one of a kind appearance just like the one who owns them.” So if you want a beautiful and unique piece that is easy to use and travel with, this is a fantastic selection. This bag has the classic Dopp shape but is made from more modern materials. The silicone body is leak and heat resistant and will protect the inside of your suitcase from whatever wet or damp items that might be inside of your Dopp Kit. The silicone also makes it very easy to clean and maintain. The manufacturer claims that it feels like leather! This bag consists of only one large zipper compartment, but at 10” x 6” x 6”, it should be able to fit anything you might need. It comes in four color options, so you can select the bag that best matches your personality. If you are looking for something practical, sleek, and modern, this is a great selection. If you are looking for a classic design and a vintage look in a material that is a bit easier to maintain than leather, then this bag is a fabulous choice. It is made primarily of canvas, which gives it a rustic and sturdy feel and is accented with leather. There is only one main compartment, and a classic side handles for easy transport. This bag is available in black, blue, green, and coffee, so you can select one that best fits your luggage and aesthetic. This bag comes with a 1-year warranty and 30-day free return. It is large enough to fit a full sized toothbrush and toothpaste, but not so large that it will dominate your luggage. If you want a classic look that is eco-friendly, this is your bag. This cloth Dopp Kit offers some key versatility and storage options. 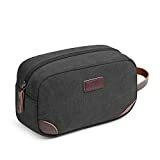 It has the one main compartment with an interior mesh storage sleeve, along with an outside zipper pocket for small and delicate items. It comes in a whopping 16 different exterior color options, and all of the bags have Herschel’s signature striped fabric lining. The downside to this bag is that it isn’t waterproof, inside or outside. But if you don’t plan on packing damp or wet toiletries then you shouldn’t have a problem. 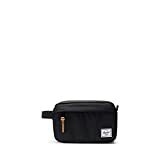 Herschel is a respected brand for their high quality, reasonably priced, fashionable bags and luggage, and this Dopp Kit is no exception. If you need something basic and no-fuss for a short trip, but still want to bring in an element of style, this product is a great choice. This Dopp Kit definitely looks luxe and expensive. It is made out of a beautiful brown leather, much like the classic Dopp Kits of the ‘20s, features a beautifully pressed logo, and strong looking brass zippers. It also has some fantastic storage options, consisting of two main zipper compartments: the classic zipper compartment across the top, and a bonus compartment along the bottom of the kit. The bag also features two inner zippered pockets, along with two travel bottle mesh pouches. This bag even comes with its own travel bottles, so you know for a fact that they will fit nicely. The silicone travel bottles are 2 oz each, which falls within TSA liquid regulations. According to the manufacturer, “Vetelli’s classic Dopp kit embraces heritage without sacrificing modern features,” which we think is dead on. This bag also comes with a lifetime satisfaction guarantee, so you can try it risk-free. If you are looking to emulate a more classic era, but still store your modern toiletries, look no further than this kit. This Dopp Kit maintains the classic shape. But this bag features some modern interior compartmentalization. The main top-zipped compartment is a half-moon shape, which means the bag will prop open nicely. The interior of the top of the main compartment has a small mesh pocket for smaller or delicate items. It also has a small hook for you to secure your bag to towel racks or bathroom railings. There is a separate front zip compartment for things you really don’t want to lose. It is made of Cationic Oxford cloth, which is durable and water-resistant and comes with a 12-month guarantee. With two neutral color options, you can select a bag that best matches your luggage. This is a great, basic kit with a few exceptional features. If you’re looking for a bag more suited for cosmetics, check out our favorites here. Classics are classic for a reason. Pick up a Dopp Kit today and learn first hand why these bags have been popular for nearly a century!